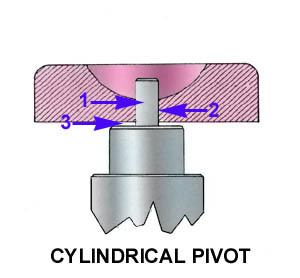 conical pivot. This friction results from the relatively thick jewel hole (2) and the pivot shoulder rubbing on the backside of the jewel (3) on the bottom pivot. The cylindrical pivot is used for the mainspring barrel and gear train of the watch. The balance wheel usually uses a conical pivot, as does the escape wheel in many finer watches.